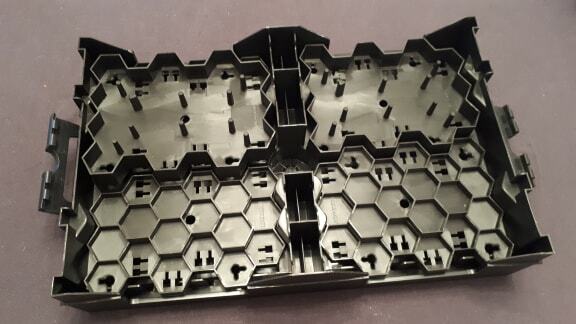 Should you find yourself in a predicament similar to myself, you’ll find a number of conclusions when weighing-up the purchase of the Hobby Project Box from Citadel. I do enjoy being able to pack-up my hobby essentials when on-the-move. However, this can be done with little to no cost should you not be picky. Is the price point of the Hobby Project Box justified in what you get? Our hobby can certainly be a cumbersome beast. If you’re intent on having everything you need for building and painting, the list of items needed can become quite unsightly. All your specific paints, brushes, clippers, glue and anything else you may wish to take. This can form a rather hefty bundle of things to take with you, especially if you’re relying on public transport or moving on-foot. This is somewhere that the Hobby Project Box lands flat, a little more literally than I’d hope. But we’ll get into that a little later. 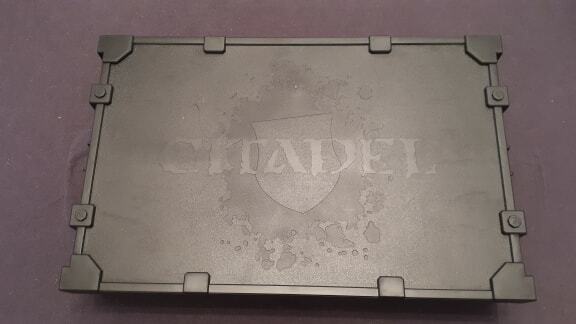 According to Games Workshop, the Hobby Project Box is marketed as just the thing needed for safely storing and transporting Citadel paints, brushes and tools. It’s hard to argue this for the most part, it’s a box and you can put things in it, certainly the supplies advertised. The items do fit in satisfyingly snugly, too. The Citadel painting handle fits wonderfully in the centre of the box along with the painting racks going in either side of the box. The paint racks are absolutely one of the key features of this box and it’s simple to see why. 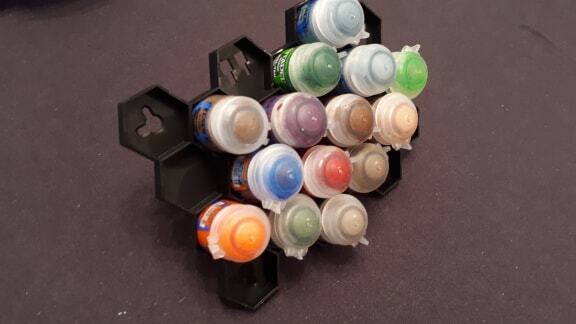 The paints pop into the hexes with a satisfying thud with a rack full of paints feeling secure and durable. You flip the rack upside down and the paints won’t budge, providing you’ve fitted them in firmly. 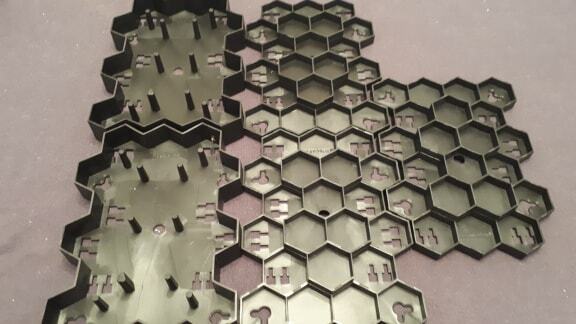 To accommodate clippers, glue and brushes you’ll find that some of the racks are “hollowed out”. These aren’t as locked-in as the paints in their areas, but providing you aren’t throwing the box around you’re in no issue. Packing everything into the box is an easy feat, as you’d expect. Once you’ve got everything in there, there’s two main concerns. My first concern is regarding the Citadel paint pots themselves. Any user of the Citadel paint range is likely no stranger to the “clogging” that occurs within the lids of these pots. This can cause the lid not to seal correctly and thus the paint can leak out of the pots. The area this becomes an issue within the box is the bottom level beneath the racks. 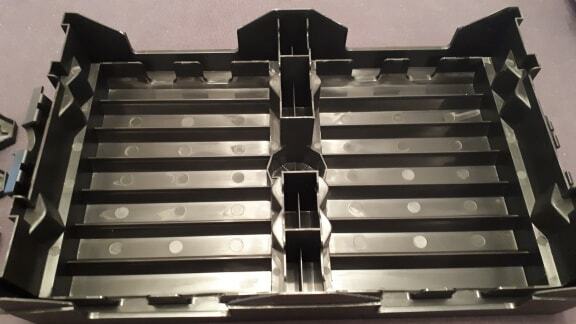 This can hold 56 paints you have to place them horizontally. If any of your pots aren’t sealed correctly then you’ll potentially find their contents splattering all over the place. The second concern is the actual moving of the box itself. If you’re hauling it in a car then you’re fine. However, if you’re carrying it by hand then this could prove cumbersome. There’s no handle of any sort on the outside of the box. Thus, you’re carrying it in your hands trying to keep it horizontal to avoid anything moving or shimmying free. It’s quite the large box, too. Thus, I’d issue caution here should you be thinking this will aid your convenience of hauling your hobby. Especially since it can hold a total of 119 pots of paint, it could likely get very heavy. Alternatively, it may well suit just being a storage unit for your various items. You’ll likely already have a storage item for keeping your various bits and bobs. However, the Hobby Project Box may be worth a look-in here. 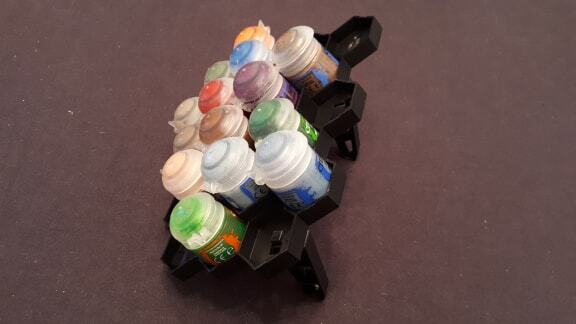 You can easily organise your paints in any fashion you choose and the racks come with legs/stands. These allow you to keep them in the racks when in use. When finished you’re able to easily tuck everything away and slide the box under your desk or into a bookcase. Those with a small area in which to paint and build, I’d strongly advise you take this into consideration! This will help to keep any communal areas in which you hobby cleaner for longer. My kitchen table now has paint pots all over it substantially less. At the price of £50, it’s quite startling considering all you get is a box and a few hex racks. However, if you have access to a car then you can feel safe in your hobby supplies being organised, secure and protected when on the go. Should you rely on walking or public transport, this box may well be better as a somewhat luxurious storage unit. It’s a nice bit of kit to have and I can see mine getting plenty of use. I visit hobby stores and engage in hobby with my somewhat distant colleagues and friends regularly. Although, I find myself sitting on a question after using this Hobby Project Box. We have seen nearly every item Citadel product being iterated and improved one way or another. They’ve even somehow had the water pot improved to surprisingly positive effect. Yet, what is one of the only products remaining unchanged and stagnent? These damned Citadel paint pots. I ask, with the other parts of the Citadel hobby arsenal evolving, when will the paint pots catch up? Imagine spending the money on this box only to have it be filled with paint from an ill-sealing pot. That would leave me feeling exceptionally sour indeed.